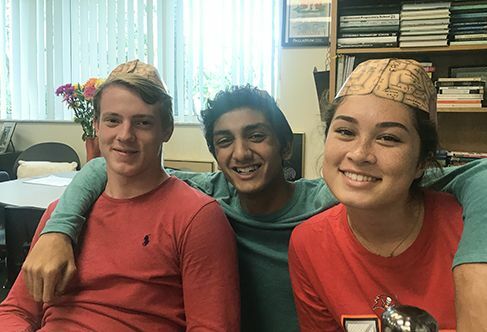 Recently, some of the seniors taking AP Psychology, informed by their research on the importance of sleep, sent letters to the administration with ideas to provide peers with greater opportunities to get increased REM time. Although they used many of the same sources for their research, their recommendations varied widely to include ideas for later start times, earlier start times, nap times, non-instructional days and non-test days. There is nothing new or unusual about a group of people researching the same topic and coming up with opposing conclusions. Educators, economists, physicians, judges and people from every imaginable walk of life use the same data to come up with different conclusions daily. So, how does one know if a decision or plan is a good one? Our seniors, like other emerging adults, are developing a personal philosophy, core values, and belief systems that will guide their decisions. Good people - like good institutions - are grounded in a philosophy, core values, and belief systems. The Five Core Values at Shorecrest: Responsibility, Respect, Integrity, Knowledge and Compassion, were identified by the community two years ago and are a focus of the work teachers, coaches, directors and other members of the community do with our students at Shorecrest. We trust that the same values are being taught at home. In our ever-changing and complex world we and our children are confronted with points of view that challenge traditions, beliefs and practices. At one period of my life, I worked on my father’s cattle farm. Beef was commonly served in our home. And while my physicians have provided me with information to limit consumption of red meat, from time to time I will still enjoy a burger or steak. However, my son, who knows a great deal more about nutrition than I, and who practices a vegetarian lifestyle for both health and sustainability reasons, makes a great case regarding the inefficient use of food and energy to produce meat products. I appreciate that he does not over-impose his personal beliefs on family and friends, and I also appreciate that his definition of responsible consumption of resources is valid. He offers a thoughtful challenge to the lifestyle I have chosen. The point here is that we both embrace responsibility as a core value. When it comes to food production and consumption, his definition and application is different from mine. I am not convinced that one of us has to be right and the other wrong. Instead, because I value ethical choices, he is entitled to live as he wishes and I will do what is right for me. No one has to be the good guy or the bad guy. Instead, we live within the boundaries that we have established as acceptable behavior. The boundaries allow us to be respectful and responsible even when we disagree. Hopefully, all of our children and students are developing a personal philosophy that allows for different points of view.